Are you excited, you’ve obviously booked your cruise and getting ready to pack your bags and sail off into the sunset. Hopefully, you’ve read my tips for first-time cruisers. Now, I guess you’re wondering what to pack for a cruise holiday. What do you need onboard, and what is supplied? Remember the cabins are small, so you don’t want to take up valuable space with unnecessary items. International cruises have the general Australian Customs regulations. Expect to have the same restrictions and searches as when you are embarking or disembarking any other international terminal. Please remember to pack accordingly. You are permitted two bags per person. Each of the bags should be less than 140cm x 60cm x 40cm. Space may vary between cruise lines but believe me; there will be little room! Think small and pack light! Cabins are small! Have I said that already? Believe me; it’s worth mentioning again. The cabins are small but well thought out if you pack well you will have ample room. But you do need to keep this fact in mind. There may not even be a shelf in the bathroom. If you pack the minimum, you will have more space, and you are sure to be more comfortable. This bag will hold your essential first-day items. It can sometimes take quite a while for all the bags to be delivered to the cabins so you may want to spend some time considering what you should pack in your carry on bag. 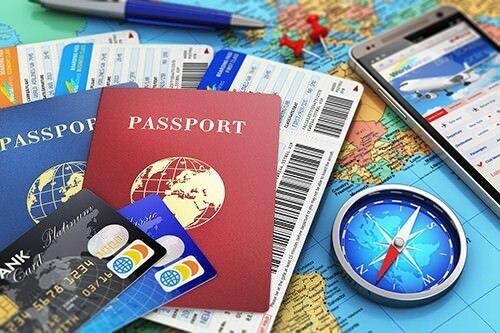 Most importantly the carry on should contain all your travel documentation, passports and wallets. Other items to include in your carry on bags. If you are prone to seasickness, you should add motion sickness medication to your carry on bag. Ladies may like to include some toiletry items in case the bags haven’t arrived by the evening. If you’re travelling with children, you may require an extra carry on bag for a change of clothes. Consider packing sealed snacks such as chips, crackers or soft drink. Packing food may seem strange, but having some nibbles with you will avoid the need to be queuing at reception or jostling the hungry hoards at the cafe immediately. This will be particularly important if you are travelling with children. I like my carry on to be an small lightweight backpack so that It can be used again when we disembark at the various ports. Perhaps choose a bag that is easy to roll up, and pack away, when it’s not in use. When you reach your cabin, you will be mortified if you don’t take this piece of advice. Each cabin usually has just one power point. It does not make for a tranquil holiday if each person is waiting to charge personal electrical devices and camera batteries. Make sure you pack a brand new power board. The best option is a power board that is still in its original packaging. Cruise lines may confiscate a power strip if they feel it looks old or unsafe. Seriously don’t. “Cruising formal” is different to “Mainland formal”. Even the fine dining restaurants only require a lovely sundress and a nice pair of strappy sandals. Seriously I know you think you won’t want to dress up in a costume, but trust me it’s fabulous fun! Don’t miss out. Find out what the theme is before packing, and throw in a costume. 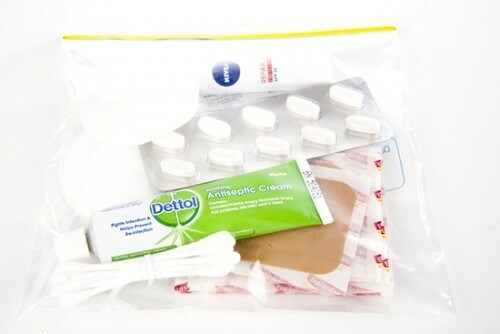 I pack a tiny first aid kit in a zip lock bag. I found when travelling internationally it’s hard to find brands you recognise, and the active ingredients in medications are all a little different. By carrying a small supply of basic medication from home, it saves the worry of being unsure exactly what you have purchased. Ok, obviously this is going to vary a little depending on the length of the cruise and the climate. I am going to assume everyone is cruising to somewhere tropical. Hmm, that should do it. Okay so I’m not serious, but if you try to keep thinking minimal, you are on the right track. Shorts and tops are a minefield, and they take up more space than a lightweight sundress. Plus I think you may be too hot in shorts and shirts on the deck? Also, it’s more comfortable to throw a dress over a wet swimsuit. So I don’t pack separates. I pack sundresses in various lengths. The long sundresses are for dining and wearing to the evening shows, and shorter dresses for on deck during the day. One set of gym gear. Trust me; you are going to be eating a lot; you may want to workout! Most cruises provide free morning exercise classes, and there is always a gym on board. Pack your most comfy tights and a tank. If you don’t work out you can always use this outfit to go ashore or for any hikes. You will also need a lightweight cardigan… No, seriously you will. No matter what the temperature is on the deck, once you go into the ship, everything is air-conditioned. It gets cold. I found I also needed my cardy on the first day of cruising while on the deck of the ship until we hit the tropical climate. So guys, now you have an easy way to pack. Take a look at what I suggested for the ladies and design your wardrobe so that it will compliment those items. How Many Shoes Should I Bring on a Cruise? Shoes take up a lot of space, but every outfit needs the right shoe! What a dilemma. 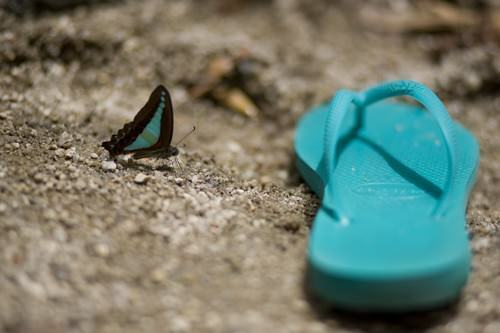 Firstly you need casual shoes like thongs (that’s flip flops for non-Aussies or Jandals for Kiwis). I try to make this shoe a little dressier, perhaps with a little heel so that it could be a poolside shoe or a dining room shoe. You will need a pair ofjoggers if you plan to exercise or go on any shore excursion hikes. Take a look at the shore excursions that are available on your cruise and decide for yourself if they require closed in footwear. Finally, you might like a second pair of shoes similar to the first. It may be something a little dressier than the first shoe I packed, and it would usually be the type of shoe I would wear in the city shopping. It’s casual but dressy at the same time. It’s usually the shoe that I board the ship wearing. Don’t pack any outfit that won’t match one of your three shoe options. This is a tough call. I would really like to hear what other cruisers think on this one. Snorkelling gear is always available for hire, but you will need to queue at each hire place to be fitted. Also, the cost of hiring gear can add up quickly if you are travelling as a family and plan to snorkel a few times. If the answers are predominate yes it may pay to pack one snorkel gear bag for everyone in your cabin. 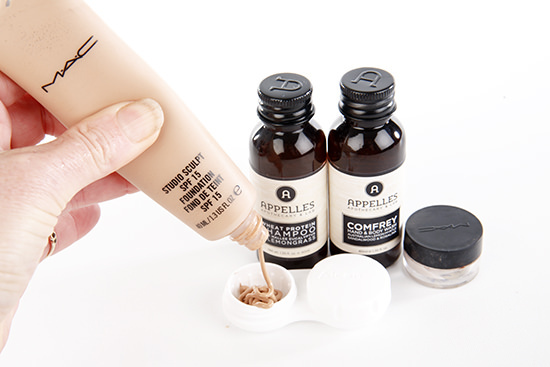 Pack travel size foundation, cleanser, toner andmoisturizer. I promise you don’t need multiple lipsticks or eye shadows. I like to dress up and look nice, but I promise, less is more on a cruise ship. Plus there isn’t any vanity in the bathroom so things could get awkward. You may need to bring a 100ml shampoo and conditioner. The travel size probably won’t be big enough for the cruise. Don’t pack a hairdryer or shaver; they are supplied by the cruise lines for safety reasons. I brought my GHD straightener on the first cruise. I washed and straightened my hair in my air conditioned room. I then walked on deck, Pfff… instant frizz! It was bye bye hairdo! I wouldn’t bother with the straightener at all. There so cheap and they are so handy! Use them as a laundry hamper in your room. Remember the rooms are small so having a spot for the dirty cloths is handy. Use one to carry wet items after swimming. (it saves lugging the bigger backpack) Throw the snorkel equipment in one… So many times onboard you will want a superlight bag. Best of all, they take up no space. I know this may seem crazy but in a world where we are used to be electronically connected it is very difficult to adjust to being unable to find someone, and unable to call and say “where are you?” My hubby and I kept missing each other at breakfast one morning, and I honestly wondered if we would find each other AT ALL that day! If you have children walkie talkies are an essential item to bring for piece of mind. You can give the children more freedom, but know that you will be able to find them when needed. Yep, it’s another crazy thing you will wish you packed if you don’t. Your highlighter will be needed each day to plan your activities. Also if you take part in the ship’s game of bingo (believe me it’s a ship thing… you will do it), You will want a bingo marker. 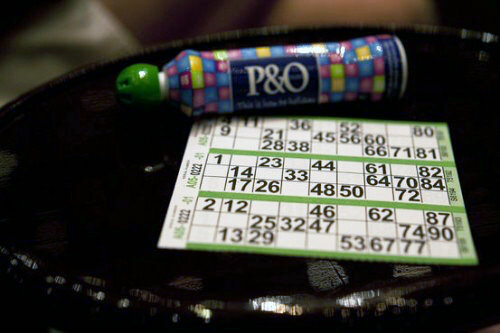 The seasoned professional cruisers even BYO their own special bingo markers. Consider packing one of these too if you have one at home, otherwise, they are available on the ship. We found that our cruise line only supplied two lanyards, one for each cabin. We had six people travelling! Each person is issued with an ID which doubles as a key to your cabin and contains your cabin credit. You need to have your ID on you all the time to make purchases. As this is the only item, you will carry all the time a bag is overkill. A Laynard is easy! Plus you will never lose your cabin key if it’s around your neck. Buying extra Laynards on board is expensive and unnecessary expense if you have them at home. So bring one from home. You may want to put it in your carry on bag. If you haven’t booked your cruise yet, take a look at my suggestions on how to choose the perfect cruise. So there we have it, my tips for what to pack for a cruise holiday. Have I forgotten anything essential? I hope not, but if you can see anything missing, please leave a note in the comments.